Chris Stapleton is one of the most amazing breakout success stories to come out of Nashville. The singer-songwriter had long been one of Music City's best-kept secrets. He released his debut solo album, 'Traveller,' in 2015 to critical acclaim and pulled off one of the most unexpected sweeps in the history of the CMA Awards, winning Male Vocalist, Best New Artist and Album of the Year. He topped it off with a star-making duet with Justin Timberlake. Stapleton is now one of the most-talked-about artists in country music. His music influences range from outlaw country and bluegrass to rock and roll and blues. His sound has been described as a blend of country, classic rock and Southern soul. Chris Stapleton is one of the most amazing breakout success stories to come out of Nashville. The singer-songwriter had long been one of Music City's best-kept secrets. He released his debut solo album, 'Traveller,' in 2015 to critical acclaim and pulled off one of the most unexpected sweeps in the history of the CMA Awards, winning Male Vocalist, Best New Artist and Album of the Year. He topped it off with a star-making duet with Justin Timberlake.Stapleton is now one of the most-talked-about artists in country music. His music influences range from outlaw country and bluegrass to rock and roll and blues. His sound has been described as a blend of country, classic rock and Southern soul. 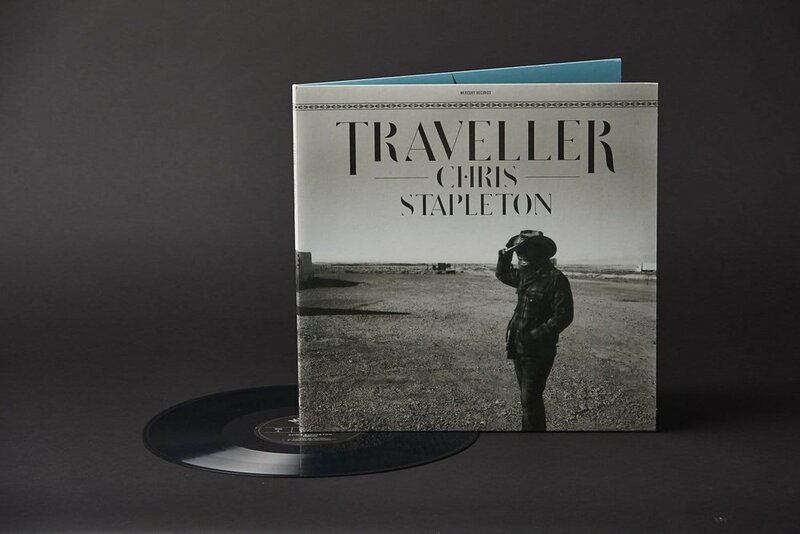 When we were first approached by Chris to create the album art for Traveller, most people knew him for his time with The SteelDrivers and his legendary songwriting cuts for George Strait, Kenny Chesney, Adele, Dierks Bentley and Tim McGraw (among others). Our job was to dream up a visual environment that could match his stunning penchant for hit songwriting in the proper epic proportions for his first breakout effort as a solo artist. We were telling Chris Stapleton’s own story for the first time. We met over breakfast one morning in Nashville. Chris and his wife Morgane told us about their recent road trip to Arizona in an old Wagoneer, with photographer Becky Fluke. During the course of the trip, Becky was able to capture those everyday rockstar moments that are lost in a studio. The roadside breakdowns, breakfast at no-name diners, moments lost in deep thought, and the well-placed and long forgotten motel wallpaper backdrops. This collection of imagery became the cornerstone for the project. We settled on an obscured polaroid from the group for the front cover. There was a sense of mystery in the grainy texture of the photo and in Chris’ windblown desert cowboy posture. A stark difference from the high gloss close-ups the industry is used to. Perfect for Chris Stapleton. We created a type treatment for the record and worked in a few details we found in the the photo collection. We created a pattern to echo the side panel details on the Wagoneer. Early designs for the type treatment incorporated snakes and feathers and hand-tooled leather motifs. What we ended with was a subtly tooled san serif with big presence. For his second release, From A Room: Volumes 1 & 2. Australian based artist Rachel Urquhart illustrated a version of a photo from the same Arizona road trip. Our job was to incorporate the commissioned illustration across a two volume set. All content on this website, including text, graphics, logos, photographs, audio and video clips and data compilations is the property of Milkglass LLC or its content suppliers and protected by US and international copyright laws. The compilation of all content on this site is the exclusive property of Milkglass and protected by US and international copyright laws.